A prominent collection, primarily of Leicestershire based artists from the post-war era, drew great excitement today at auction in Gildings’ Market Harborough salerooms. A broad range of artworks from oil paintings to abstract sculpture were offered in today’s Fine Art & Antiques auction, originating from a private collection of a late Leicestershire gentleman, who had lived on The Green, Anstey, for a number of decades. The 53 works, amassed over a lifetime of collecting, sold for a total in excess of £91,000. The collection featured a great many art works from some of Leicestershire’s most prominent artists of the mid to late 20th century, including names such as Robert King, Ken Ford, George Pickard, Rigby Graham and Bryan Organ. “In the years immediately after the Second World War, Leicester was not renowned as a cultural centre, “says Will Gilding, Director at Gildings Auctioneers, “but there was a highly creative vein of artists, most of whom were colleagues and friends through the then Leicester Polytechnic, but many were also exhibited through The Gadsby Gallery, Market Place, Leicester. 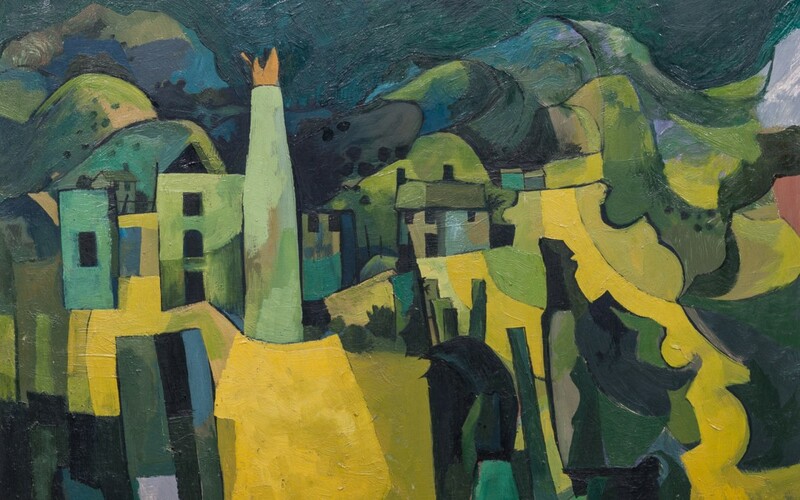 Between them they depicted Leicester and the environs in often vivid detail – such as in the works by Rigby Graham – but also brought the abstract and modernist art movement that was buoyant throughout the UK during those years right to our doorstep. Many were commissioned for works in local schools or public spaces. It is rare to see a body of so many of our artists’ in one collection, and even rarer for them to be offered at auction in the county. The level of pre-sale interest was highly re-assuring and it showed in the results today. Bidding was fierce throughout,” reports Mr Gilding. Some choice highlights include a Cornish mining landscape by Rigby Graham making a hammer price of £2,100; a bronze sculpture by Ken Ford of The Three Graces making £1,600; an abstract sculpture by George Pickard making £800; and a Bryan Organ landscape making £800. The sale also featured a small collection of Leicestershire based jewellers – Tom Payne and Peter Triggs of Hinckley. Known for their abstract jewellery designs in the 1960s through1980s, four pieces offered here today, all striking an very individualistic, totalled £1,800 hammer. The sale, featuring 544 lots of Ceramics, Glass, Works of Art, Paintings, Jewellery, Art and Furniture, took £310,000 overall, cementing Gildings as Leicestershire’s leading auction house.